Your company is planning to move office and you have been tasked with finding the right office space, where do you start? 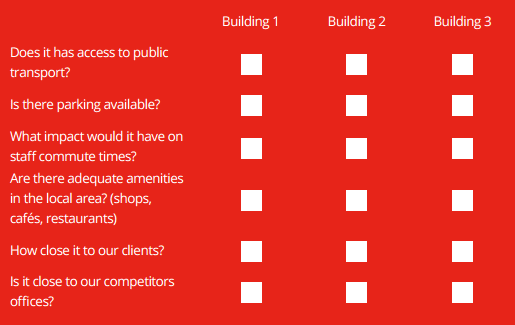 How do you evaluate the different spaces to determine which one is the best option for your company? 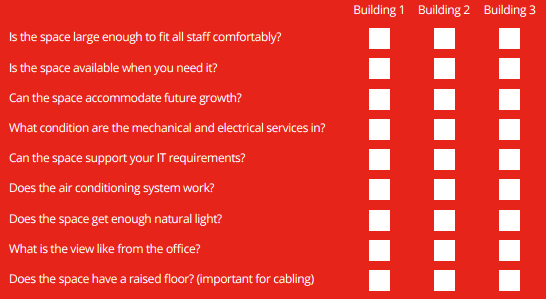 This short checklist includes several different criteria that we think should be used to rank each space and which we hope helps you to find the right office space. 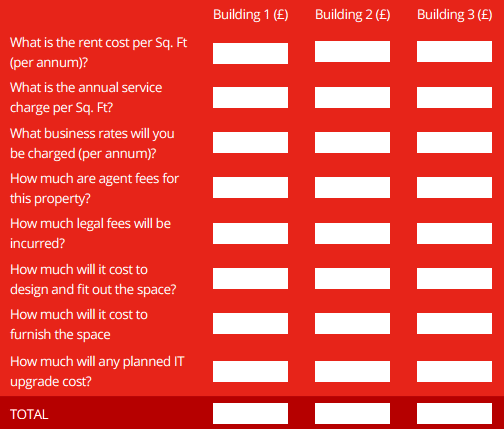 There are columns and boxes to tick for each category so you can score each property, and at the end, count each score and discuss the pros and cons of each space. You can download the PDF version of this checklist by clicking on the Download PDF button at the top of the page. Deciding where your new office will be located is probably the single biggest decision to make, and one of the first to consider as it has a major impact on several factors. Tip: Ensuring that you pick the right location for your new office is critical as it can have an impact on attracting and retaining the very best talent. Selecting a location where people want to work is something worth considering. It is important to make sure that the building you are moving to is in good condition and that there are no major works planned in the near future. 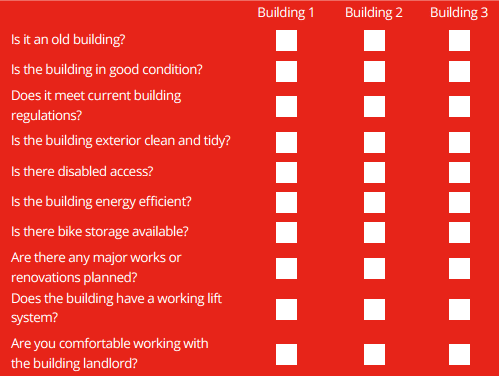 Your new building should tick all of your requirement boxes and also provide your staff with a comfortable work environment. Tip: Remember that your workplace should reflect your brand so ensure that your chosen building is somewhere you are proud and happy to bring clients to. An ugly building or a building in ar undown area can leave a lasting impression. Once you have determined the location and happy with the building, it is time to review the space that may become your new office. Your new office space should comfortably fit all of your staff, accommodate anticipated growth and provide your staff with a work environment that allows them to reach their full potential. Tip: An office design and build partner can work with you and the landlord to assess the office space and also the condition of its mechanical, electrical and IT systems. They can also provide a test fit to ensure all of your staff (including future team members) can fit comfortably into the space. Agreeing on a budget for your office move (and sticking to it), is crucial to ensure you get the office space that you and your staff deserve. Our team have actually written an article focusing on office fit out costs, which should prove to be a useful and informative read. Once you have found the right office space, it is crucial that you select an office design and build company that you trust, who can work to your budget and who share your vision for the new workplace. They should also be able to help and assist you every step of the way, providing test fits, dealing with the local authorities and landlords to get the necessary permissions, helping you to select the right office furniture and ensuring your move is as stress free as possible. Now that you have selected a location and are busy finalising terms for your new space, it is time to select an office design and build partner who can help you create an amazing new workplace. There are a lot of companies who can help and while you may receive numerous calls and emails from contractors, we would recommend conducting your own research online and getting recommendations before making a shortlist. 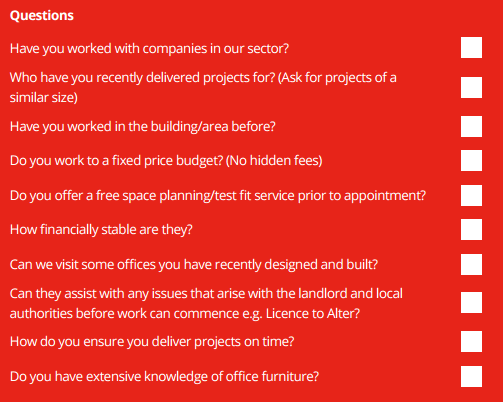 We’ve also created a short list of questions to ask your shortlisted firms.